The weather is changing and it’s turning to that time of year I despise—COLD. Cold means that the battles between Captain Couch and I have intensified. We’ve thrown down a lot since September and he’s just been out of control. I’m way out of shape. Dude has been beating me senseless every single night, and no amount of comics can hold him at bay. As a result, my nights lately have consisted of bad television and passing out unconscious by like eight p.m. (if I make it that far). Reading comics has fallen distressingly by the wayside. One of these days I’ll take a photo of my “to read” piles of issues and trades and post them here for your viewing horror. “Piles” probably isn’t even a fair word. More like “mountain chains.” Some people dream of climbing K2. I just dream of scaling down my comics. After the debacle a few weeks ago about Starfire, it’s good to see we’re moving forward, DC. On the flip side, Robot 6 has a rather humorous strip wrapping up the New 52 from the perspectives of the characters. Very fun. Speaking of strips, do you like web comics? Have you heard of Max Overacts? No? Well you should check it out, because it’s absolutely wonderful. The creator, Caanan Grail, is brilliant, and I’ve been addicted to this since I stumbled upon it last month. Many have compared the strip to Calvin & Hobbes—there’s definitely an echo of that there—but it’s its own thing and so much more. Start at the beginning and read through the strips; I can’t imagine you’ll be let down. 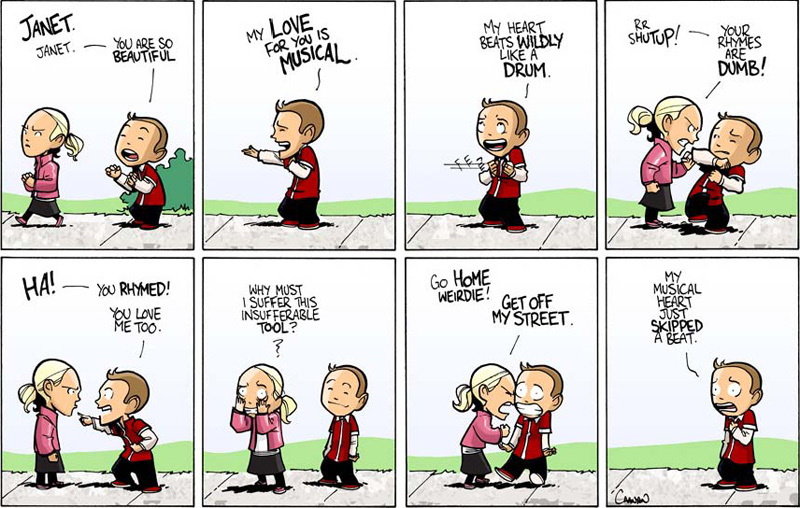 A strip from Max Overacts, by Caanan Grail; click to enlarge. Lastly, I hope everyone’s seen the newly-released Avengers trailer, because it’s awesome. … And that’s all I got! Back later with some reviews. This entry was posted on 10/14/2011 by ravenhaired. It was filed under Awesomeness, Comic books, Female Characters / Creators, What I'm Reading / Wednesday New Comics and was tagged with Captain Couch, DC, DC Reboot, New 52, webcomics.